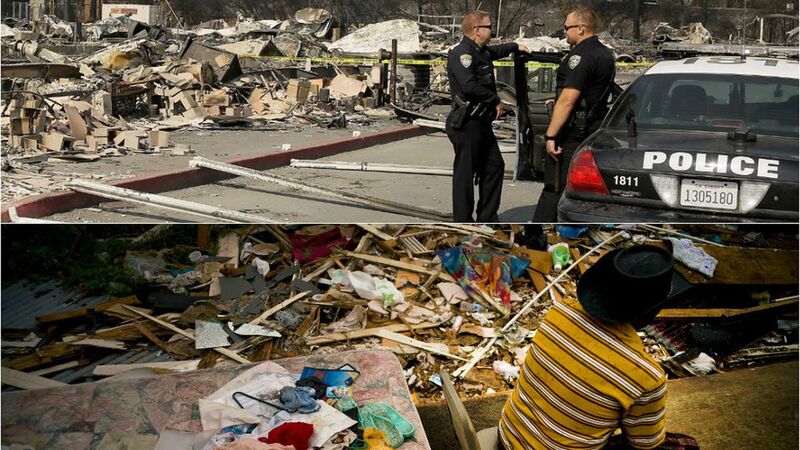 Top: Two policemen watch over the remains of a mobile home park in Santa Rosa, Calif. (Photo: Eric Risberg / AP). Bottom: Efrain Diaz Figueroa sits next to the remains of his sister's house in San Juan, Puerto Rico. (Photo: Ramon Espinosa / AP). While Puerto Rico struggles to recover from Hurricane Maria that made landfall over three weeks ago, California has battled disastrous wildfires this week that have killed at least 38 people. Several thousand residents were told to evacuate Saturday according to CNN. 297 people are were unaccounted for in Sonoma and Napa counties, as of Friday night, per the San Francisco Chronicle. Increased winds are expected this weekend, per the U.S. Forest Service. Around 90,000 people are displaced due to the fires, per the Washington Post. As of Friday afternoon, around 5,700 structures were destroyed, the San Francisco Chronicle reports. Over 10,000 firefighters are battling the fires, Reuters reports, including California inmates that volunteered. BuzzFeed reports that Puerto Ricans are "being given drinking water from Superfund sites," which could be contaminated with hazardous chemical waste. 34% of Puerto Rico is without access to fresh drinking water, per BuzzFeed. 5,602 people still remain in shelters on the island. There are more than 20,000 military service members and civilian personnel assisting in recovery efforts, per FEMA. Go deeper into Puerto Rico's numbers with Axios' Alayna Treene.